When John Browning worked on his Superposed O/U shotgun, which was finally finished posthumously, Mr. Browning envisioned it as one of the last firearms governments would try to steal away from their people. As it turned out, John Browning was mostly right, for repeating shotguns are frowned upon in much of the world or just plain banned. A good O/U shotgun isn't cheap to produce, for of course there are two barrels, two trigger sears, and more elaborate machining and fitting required. Plastic stocks and rough, matte finishes or camo dipped are still resisted, for the “Aristocrat of Shotguns” still is a sign of prestige, quality, pride of ownership, and the gun-makers art. The good O/U shotgun has crisp, light triggers built upon a steel frame, not an injection-molded plastic housing. The good O/U shotgun has barrels that shoot within a couple of inches of each other at 35 yards or so. There is a myth that cheap O/U shotguns are mostly junk. That myth has proved to be true. A good quality, durable O/U has a steel receiver. The manufacturing crime of the Benelli 828U shows what happens when the design criteria includes how cheaply a shotgun can be produced. Over the years, there have been countless forgettable, crude attempts at the cheap O/U. It has not worked well. If just purchase price is the factor, you'll get more quality and value for $1000 - $1500 in a slide action or an autoloader and your shots are going to hit the same place, round after round. On the world stage, American gun-makers operate at a 35% or so manufacturing deficit compared to most of the world. The successful, mainstream, affordable American-made O/U shotgun does not exist. The closest we had was the Ruger Red Label. The latest attempt by Ruger in getting cost out the gun ended badly, and it was an epic screw-up that has likely ended Ruger's re-entry into the shotgun market for good. Remember when Marlin tried to relaunch the L. C. Smith name? Smith & Wesson with the Turkish-made “heirloom” doubles? Weatherby, after SKB, trying Fausti? Sigarms trying not once, but twice with the SA-5 and SA-3 line? Savage with their Milano (F.A.I.R.)? The Lamber? The Remington Premier (Sabatti)? Franchi division of Beretta now selling Bettinsoli? The original Mossberg Silver Reserve? If you are interested in spectacular failures, the O/U market is one place that won't disappoint you. If history teaches us anything, it is that good O/U's don't make themselves and they sure don't sell themselves, either. Browning has been struggling with the Winchester Supreme, renamed the Winchester Select, now sadly renamed the Winchester 101 for so long I'm surprised that they still exist. It is been a 16 year attempt by now. The good news, for the American consumer anyway, has been the crash of the Euro and the Japanese Yen vs. the dollar, for reasonable quality O/U shotguns are a better value today than ever before. You've no doubt heard it before, but standard, reasonable quality O/U shotguns start with the Beretta 686 and the standard Browning Citori: both are good guns, with the Citori the most popular O/U ever made. Competitive with the Beretta 686/687/690 and also the 725 Citori as a field gun would be the Fabarm Elos. The Beretta 690 is new and in the minds of many, a bit overcomplicated and not as desirable as the older 682. In 12 gauge, the Elos is sold as the Orvis Elos at $2395 or so, also offered in 20 and 28 gauge. Fabarm USA offers versions of the Elos in 20 and 28 gauge. The Beretta 690 Field III, the Caesar Guerini Woodlander and Caesar Guerini Tempio are roughly in the same price bracket. There are several reputable dealers for used guns: Cole Gunsmithing, Art's Gun Shop, and Joel Etchen to name but three. Aside from Beretta and Browning, there are good quality O/Us out there under less popular nameplates: the Savage Milano as a field gun, the Weatherby-SKB Orions and Athenas, and so forth. If a used O/U is worth buying, it is worth paying an experienced, qualified gunsmith to give it a clean bill of health. 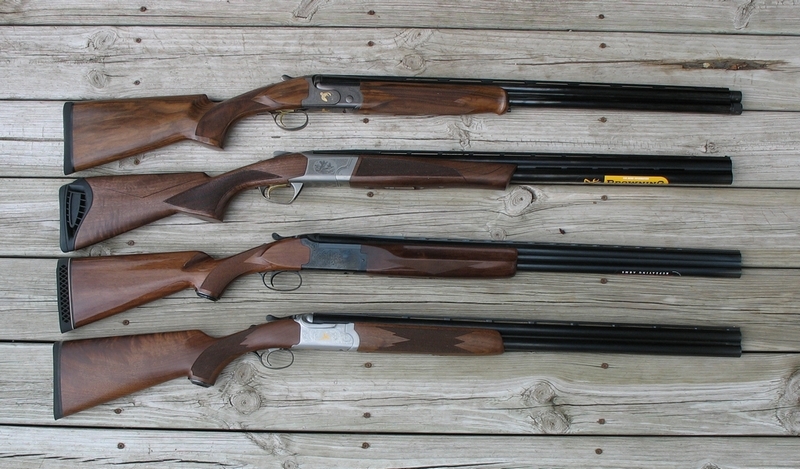 Standard quality O/U shotguns begin with the plainer Beretta 686 and Browning Citori models. Personally, I favor the Browning Cynergy now that Browning has found new religion in this lower-end price bracket. Whether it is a Beretta 687 with a bunch of E's and L's after it or not, it is the same gun. Same goes with a Citori or a Cynergy: the higher grades get you no more functionality, they just get you upgraded wood and assorted bling. All Caesar Guerini USA sells are O/U shotguns. All have lifetime warranties, free service visits, and outstandingly good customer service. CG speaks O/U fluently and exclusively. Without the extra engraving and bling, the Fabarm USA models are commensurately economical. It is the RS-12 for clays guns, the Elos as hunting guns. It is a five year warranty, with the same customer service staff and in-house gunsmiths as Caesar Guerini USA. Over most of my life, I've watched as low-end O/Us quickly fail and fade from the marketplace. There is scant little less satisfying in firearms than a crummy O/U shotgun, in my view. Even some reasonably good vertical doubles are long gone, due to misguided marketing attempts or uneven quality controls. It takes a lot of effort to consistently offer good O/U shotguns, backed by parts inventory, experienced in-house gunsmiths, and customer service. Quite unsurprisingly, the cheap O/U can turn out to be the most frustratingly expensive shotgun of all.